Turntable U is "The World's Premier Online DJ School." Our curriculum is structured to sharpen your talents, emphasize fundamentals, and define your strengths and weaknesses in order for you to become a successful DJ. Beginning DJs will be able to grasp the basics of mixing, blending and scratching within a few lessons. Intermediate and Advanced DJs will be able to brush up and fine-tune their skills and stay up to date on today's cutting edge techniques and scratches. Whether you want to learn the basics, expand your scratch techniques, or learn how to be a radio DJ, Turntable U makes learning easy, accessible, fun and affordable. Turntable U is the first online DJ school to give DJs around the world direct access to high quality DJ tutorials. All lessons are presented through state of the art digital video production. We bring you unequaled access to turntable fundamentals that are essential to being a well-rounded DJ. In addition, Turntable U will help you to refine your own DJ style which is the secret to success. Turntable U's world renowned faculty of DJ instructors takes the guesswork out of learning. All you have to do is PRACTICE! Learn to how to rock the party from DJ legends you know and respect. No matter what type of musical genre you prefer or your skill level with Turntable U you will be able to rock the party. Quick Creative Talent Production & Imaging Services is the company to service your voice-over and imaging needs. Need a different sound? Looking for a new voice? Need to Re-invent your brand? Quick Creative Talent Production & Imaging Services is the answer. Turntable U is "The World's Premier Online DJ School." Turntable U is also the first DJ school on the world-wide web to give students direct access to high quality tutorials, taught by the most respected names in turntablism, presented via cutting edge videography & graphics. "Learn from the Pro's you know and respect," Turntable U's has over 40 world-class DJ instructors including DJ ICY ICE, original member of "World-Famous Beat Junkies" & owner and founder of Stacks Vinyl [recognized as the #1 DJ record store in Los Angeles four years straight by L.A. Weekly]; DJ DEBONAIR, Tour DJ for superstar Keith Urban; and Tony G original KDAY Mixmaster, Producer, & DJ & West Coast Hip Hop Legend!. Turntable U lessons are streamed in high-definition utilizing state-of-the-art digital-video production! Whether you want to learn the basics, expand your scratch techniques, or learn how to be a radio DJ, Turntable U makes learning easy, accessible, FUN and affordable. Turntable U's curriculum emphasizes fundamentals geared to sharpen students' talents and define their strengths and weaknesses in order to become successful DJ's. Beginning DJ's will be able to grasp the basics of mixing, blending and scratching within a few lessons. Intermediate and Advanced DJ's will be able to brush up and fine-tune their skills and stay up to date on cutting edge techniques and scratches. Turntable U's website, www.TurntableU.com, not only brings unequaled access to world class DJ instructors, but will also keep students up to date on DJ news world-wide, offer exclusive access to gigs equipment and software upgrades, and much much more. In addition, Turntable U will helps students refine and develop their own unique DJ style the secret to success. 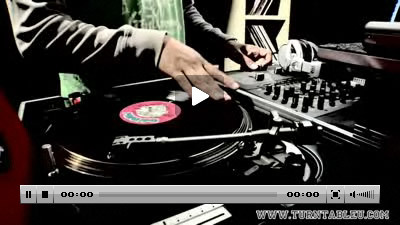 Turntable U's world renowned faculty of DJ instructors takes the guesswork out of learning. All Turntable U demands is PRACTICE! Learn from DJ legends you know and respect. No matter which musical genre you prefer or your skill level with Turntable U, you WILL rock the party!